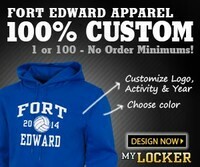 Welcome to Fort Edward Athletics! Fort Edward spirit wear sh op. When you checkout, use discount code BT445 and you will receive $9.00 discount, which is 50% off one custom t-shirt. You can buy additional items at regular price and our school earns 12% too! Find out how our teams did. Become a master of the Rubik's Cube with this tutorial. Learn how to solve the cube with the beginner's method!